The last full-service gas station in Mason City closed on Thursday. 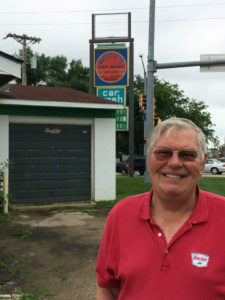 Wooz’s Car Wash has been a fixture since 1972, but owner Henry Pirhonen has accepted an offer to sell the property to Kwik Trip which plans to build a Kwik Star store there. The station’s car wash was always popular and has scrubbed perhaps a half a million cars since Pirhonen took over the facility. He says they’ve sold a wide array of products besides gasoline over the years, including Christmas trees. Prior to the digital age, the service station was also once home to a photo hut, where people could drive up, drop off their film, and return later for an envelope filled with their pictures. Officials with Kwik Trip Incorporated say construction on the new store will start next spring.